Goodreads says, "For months Clara Gardner trained to face the fire from her visions, but she wasn't prepared for the choice she had to make that day. And in the aftermath, she discovered that nothing about being part angel is as straightforward as she thought. Now, torn between her love for Tucker and her complicated feelings about the roles she and Christian seem destined to play in a world that is both dangerous and beautiful, Clara struggles with a shocking revelation: Someone she loves will die in a matter of months. With her future uncertain, the only thing Clara knows for sure is that the fire was just the beginning. In this compelling sequel to Unearthly, Cynthia Hand captures the joy of first love, the anguish of loss, and the confusion of becoming who you are." Things pick up where Unearthly left off and Clara is getting a new vision. This vision is different from before, because all clues point to the fact that she will be attending a funeral for someone she loves before the year is over. On top of that ominous vision, Clara is still haunted by the fact that she defied her purpose and this guilt continues to linger. Readers will find Clara still with good guy, Tucker, and yet she can't deny her attraction to fellow angel, Christian. Despite the drama in her love life, Clara must find out whose funeral she is attending in her vision and ultimately, learn more about what it takes to be part angel. 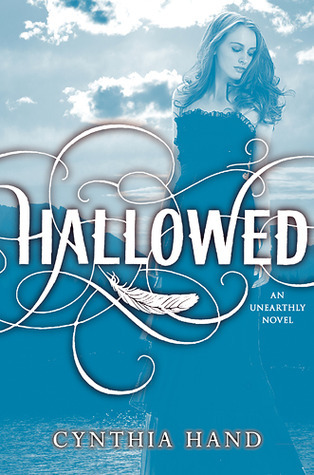 In Hallowed, Cynthia Hand's follow-up to Unearthly, readers will once again be transported to Clara's addicting world. The Unearthly series is hands down the best angel series that I've read to date. Clara really grows in Hallowed. She is finding more out about what being an angel is all about and not just from Angela speculations while hanging out in Angel Club. She learns more about her mom's past as well as her father's. Also, she is trying to move on from the fact that she didn't fulfill her purpose and in Hallowed we learn more about that as well. When I read Unearthly, I promptly declared my love for Tucker and would have sported a "Team Tucker" t-shirt; however, in Hallowed somehow the brilliant Cynthia Hand has made me rethink my loyalties. Christian really grew on me in Hallowed and now I am definitely torn. Well played, Cynthia Hand, well played. Hallowed was so emotional. Seriously. I was completely blindsided by how I would feel when reading this book. Hand did an outstanding job making me, alongside of Clara, feel such sorrow, love, and anger. Normally I usually feel sort of let down by the second book in a trilogy, but Hallowed was just as good as Unearthly in my opinion. Hand is a fantastic storyteller and I wasn't bored for a second. If you are looking for an addicting and awesome paranormal series, you MUST read Unearthly and Hallowed. And thank God that Boundless, the conclusion to the trilogy, is out already. I need to get my hands on a copy stat. Yes, she does make it difficult. I can't wait to start the final book. I am going to be reading it next. Thanks for visiting, Sara! Oh really? I can't imagine Christian growing on me. I love Tucker. I really need to read this. I've had it for ages. I know, right?! I was such a Team Tucker fan, but now I am second guessing myself. I hope you get to read it soon. Thanks for visiting, Becky! "When I read Unearthly, I promptly declared my love for Tucker and would have sported a "Team Tucker" t-shirt; however, in Hallowed somehow the brilliant Cynthia Hand has made me rethink my loyalties. Christian really grew on me in Hallowed and now I am definitely torn. Well played, Cynthia Hand, well played." RIGHT?!? I was firmly Team Tucker after Unearthly, but Christian worked some magic in this second book and even more in Boundless to where poor Tucker was losing ground rapidly. I stayed loyal to him though because I can't bear to switch loyalties after I've already chosen a team, but Christian nearly had me:) So glad you loved this book too! I am afraid to start Boundless for this very reason!!! She has me second guessing myself! Thanks for visiting, Jenny! I am excited to start Boundless this weekend! I will have to check out Radiant. I forgot about that novella. Thanks for visiting, Leanna!